Scenario teams definitely do not get their fair share of recognition in the paintball media, despite the fact that many of these crews have been together longer and do more to promote paintball in a positive light than the vast majority of tournament teams. To help balance the scales, PaintBall.com will be running team profile features on various scenario teams throughout the world to highlight the efforts and dedication and the players that travel from event to event with no thought towards fame or sponsorship. 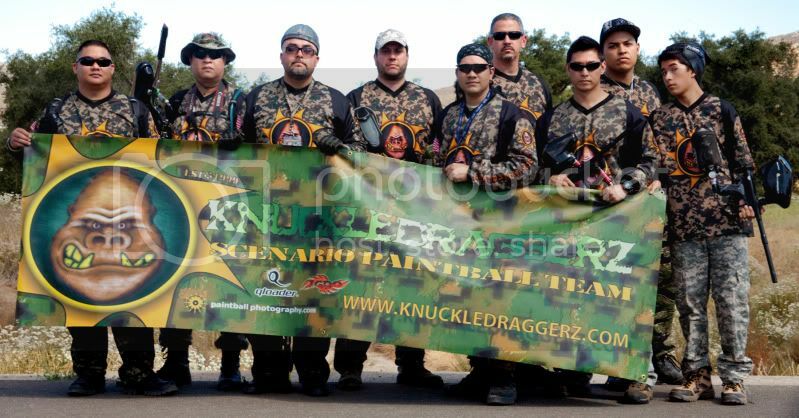 To start off this unprecedented article, we've decided to take a look at the Knuckledraggerz, a well-known Southern California scenario team. Team Summary: We are a co-ed team established in 1999 and based out of Southern California (Los Angeles area). We believe that above all else, the sport of paintball should be enjoyed by everyone. We strive for a fun atmosphere and we pride ourselves in having brought many new faces into this great sport. We believe in fun, safety, and honorable play. We are always looking for new members, be it a seasoned veteran, a first timer, male, female, young or old. Join the Knuckle Draggerz: Membership is open to players from all walks of life. You can fill out a membership application HERE.